Our Team of lay and ordained people serves 22 churches from across the western side of Leeds. Together we undertake to share the Good News of Christ’s love and to support the work of our local churches as they share his abundant blessings across their communities. Our Deacon comes to us with wide experience. He trained as a teacher, worked in a department store, ran a community centre, lived in a small community house in the inner city, and volunteered in community mental health before offering for Diaconal Ministry. He has served in Salford, Stockton-on-Tees, Wakefield, Morley and Sheffield, and has been a Chaplain in Prisons and Mental Health Services. Pastoral responsibility for Central, The Grove and Rodley. I was born in London and spent most of my early years in Surrey having moved there with my parents at the age of 6. After leaving school I went to Durham University to study Economics and it was there that I met Jenny, another southerner. After a short period gaining experience of doing a "normal" job, Jenny and I married in 1981, just before I started my ministerial training at Wesley House, Cambridge. My first circuit appointment was in the Durham and Deerness Valley circuit where I had started my local preaching a few years earlier. I was the minister of three churches in ex-mining villages in an area with a strong Methodist history. After 5 years we moved to the Aldershot, Farnborough and Camberley circuit, by now a family of 4, Jo and Nicky having been born in Durham. While in Farnborough I was the minister of two churches, the larger of which had been a garrison church and still had very close links with the military. I was a part-time chaplain to 7th Royal Horse Artillery and to R. A. F. Farnborough. In 1995 we moved to Yorkshire and to what was then the Otley and Aireborough circuit. I worked principally in Bramhope, where we lived, and Yeadon both of which communities will be well known to many of you. We stayed in the circuit for twelve years for most of which I served as superintendent. For the last ten years we have been living in Harrogate. We have overseen a major redevelopment at Trinity Church which has helped the church to find a new sense of purpose and drawn a significant number of new families into the life of the church. Until Easter Jenny worked as a special needs teacher at Beckfoot School in Bingley having been there for over twenty years, which is good going for the wife of a Methodist minister. Our elder daughter Jo is married to Stephen and they live in Penge (south London). Jo works for a small publishing firm in London editing and publishing history books. Our younger daughter Nicky also lives in London and got married to Philip in July. Nicky is presently doing her clinical psychology training in Guildford having previously worked with people suffering from eating disorders. I am looking forward to getting to know you over the coming weeks and months. It is my hope and prayer that through the faith that we share we may work together in the service of God as we seek his way forward together. LOCAL CHURCHES are the “Grassroots” from which most mission work and worship is delivered with the help of many volunteers. Churches are grouped together in CIRCUITS who provide collective support. Circuits make ministerial appointments and provide accommodation. Lay employees and volunteers are also recruited. Ministers are assigned pastoral care for a group of churches. A central plan for worship across all the churches is created. 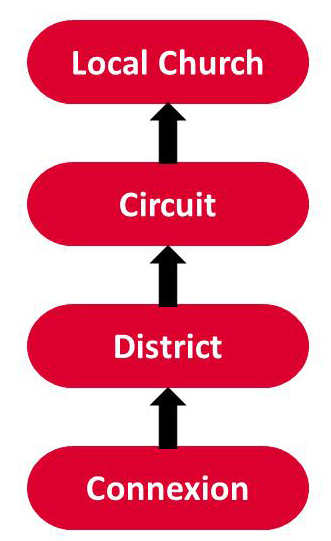 Circuits are then grouped together in wider areas which are called DISTRICTS. We are in the Yorkshire West District. Support can include: Training, pastoral care, media relations, property and legal advice and organising larger initiatives. The Methodist Church in Great Britain is known as the CONNEXION and our overall policies are agreed through the work of the council and our annual conference of representatives, including matters of doctrine, structure, legal, financial, and social issues.